Oh, Jon Voight…. oh my. Unfit for the presidency, 6. I bought John Mellencamp’s new CD today. I was listening to it in my office and Jena, the song Mellencamp released last fall came up… I had forgotten about it. This video or group may contain content that is inappropriate for some users, as flagged by YouTube’s user community. By clicking “Confirm”, you are agreeing that all videos or groups flagged by the YouTube community will be viewable by this account. The video does contain images of lynching, and of klan members in their lovely, courageous hoods and robes. I do remember the brouhaha when the song came out last fall. And of course other people wrote about it back in October when it was released. It’s still quite a powerful song and video. The blog Tasered While Black has been tracking the issue of black folks being tased for some time now. Amy Goodman of Democracy Now is tracking the death by taser of a black man in Louisiana. 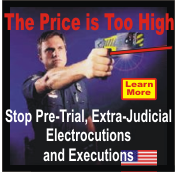 We are blogging today against police and other security entities across America, Canada and around the world involved in Extra-Judicial Electrocution by Tasers. African American Political Pundit has called it a campaign against “on the spot pre-trial electrocution” of members of the public (many who are of African descent).